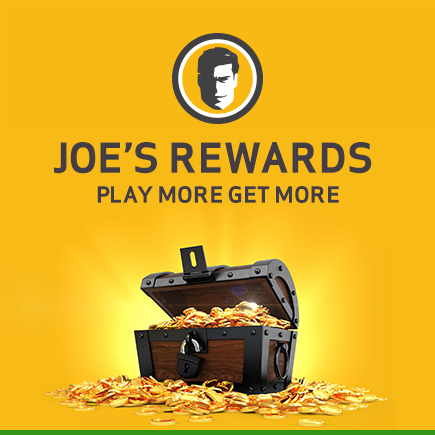 Get ready for the escapade of a lifetime with the recently launched Joe’s Rewards program, with new, updated features and a fantastic storyline that players won’t want to miss. Expect unique, Indiana Jones-style tier levels (or volumes as we call them), great benefits, the ability to earn Adventure Points, special bonuses, and so much more. The more you play, the more Adventure Points you’ll earn, which can be exchanged for cash bonuses to boost your gameplay anytime. Even better, your status will remain locked, so you’ll always be a loyalty member no matter what. Once you sign up, you’re automatically enrolled in the rewards program – and that’s when things start getting epic. You’ll start earning Adventure Miles immediately, and can embark on the quest for riches. There’s a reason why the program’s slogan is ‘Play More Get More’. It’s exactly what you’ll find yourself doing, mate! With eight unique tier levels called ‘volumes’, you can unlock new adventures and perks as you rise higher in the ranks. And unlike other programs, you won’t lose your status. You’ll stay locked at your volume until you make it to the next tier level. Check your points balance, status level and more. Get your cash rewards instantly. Come on down to Joe Fortune Casino to start playing online casino games and learn more about tier levels, points conversion, and terms and conditions.